When summer winds down and temperatures cool off a bit, an ice-cold glass of lemonade with a plate of barbecue doesn’t feel nearly as tempting. Instead, diners crave warm flavors and seasonal produce–squash, cinnamon, pecans and of course, pumpkin. For operators in the non-commercial segment, it’s the perfect opportunity to switch things up—after all, according to Technomic’s 2017 Flavor report, nearly half of younger diners (47%) and 32% of diners overall say that their preferences tend to change depending on the season. To get some inspiration for fall menu items, check out these three trends. Braises are a trending dish for fall this year, particularly when they include some emerging ingredients and flavors. Technomic’s MenuMonitor calls out tatsoi as an emerging trend on menus. This Asian green tastes similar to spinach and can be prepared similarly as well—served raw or cooked. It has a soft texture with a subtle yet distinct flavor, which makes it an ideal ingredient in cool-weather braises. It can stand up to long cook times, and it complements meat dishes well. Mole is another seasonal flavor that can work well in braises. Its richness and complexity is perfect alongside chicken, beef, lamb and pork. Serving roasted potatoes alongside these dishes is the perfect complement; the potatoes’ rich roasted flavor pairs well with braises and tastes great with the braising sauces. What goes better with a slow braise than roasted vegetables? 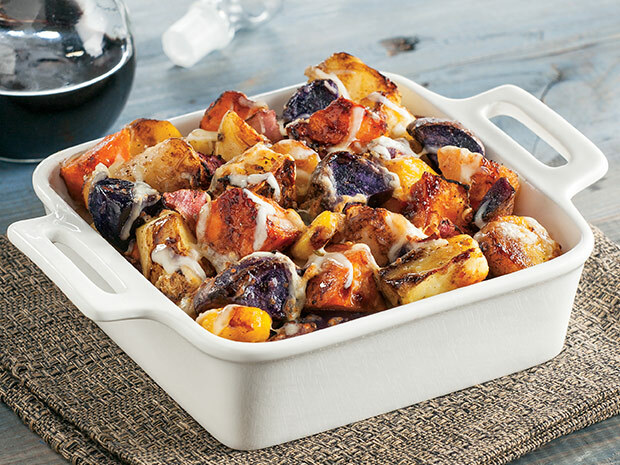 For that pairing as a standalone dish, roasted vegetables are another fall trend to watch. At Texas State University’s Commons Dining Hall, for instance, balsamic glazed roasted vegetables are a popular side dish. Roasted veggies are great as part of an entree as well—at Arizona State University’s Tooker House, diners can get the roasted vegetable wrap, which features roasted vegetables, pesto mayo and provolone cheese in a wrap. Ideal alongside meat yet perfect for vegetarian dishes, roasted vegetables can come with seasonal glazes or be served straight up—the deliciously intense flavor imparted by roasting needs no accompaniment. As summer greens and bright pasta salads take a bow, grain salads make their way to the spotlight. But where quinoa and wild rice have stolen the show before, new grains are taking over. MenuMonitor highlights rye berries—whole rye kernels that have a rich, earthy, nutty flavor that can pair well with veggies such as mushrooms, roasted squash, broccoli and more. This “new” grain is actually an ancient grain and can be used in virtually any application where other grains like farro, barley and quinoa are used. For a seasonal twist, operators can serve a sweet rye berry salad, with cashews, persimmons, cooked beans, rye berries, currants and a sharp yet tasty vinaigrette. Other alternative grains include corn–when roasted and topped with options like shrimp or other veggies, corn provides a great base for bowl meals, too. Corn is traditionally thought of more as a vegetable, but provides a delicious sweetness to any meal where a grain would be used.